Kyle & I enjoyed our evening at Residence very thoroughly, don’t be mistaken. A Saturday evening in the life of a University student leaves little to be desired if you’re searching for interesting and memorable times. On this one occasion, however, Kyle & I both (or I certainly did, anyways) knew that there was something else. Something coming up rapidly in a number of hours that we would also enjoy immensely, and I, for one, was looking forward to it from the minute we left that dig site the first day. Still, my Girlfriend, Cassie, my roommate Ben, and of course, Kyle & myself, all celebrated Kyle’s turning of legal drinking age. A few drinks, a few good jokes, and a few interesting photographs later, we were all in bed, and I was sweetly dreaming of the glass we could, and hopefully would, find the next day. Then, out rang the familiar “BZT BZT BZT” of my alarm signalling the beginning of another beautiful day. The sun was shining, and although it was a little chilly out as expected, it looked like a glorious day for digging. Kyle, Cassie, and myself, all arose, dressed ourselves, ate breakfast, and then hit the road. The first stop was dropping Cassie off at her home in east London. I drove like a paramedic to get her home, and then again to get to Strathroy in time to start digging at 10:00 AM. We pull up to the dig site – Jim was not yet there. We retrieve our gear from the trunk of my car (ever present – as one never knows when one may need to dig for bottles or insulators), and begin to work! We more or less continued digging in the same method as the day before – outwards in a circle from the small test holes we had begun. More shards from G. E. Murdock, R. Taylor, and J. Tune bottles mostly, although this time quite a number more seltzer bottle shards seemed to emerge. 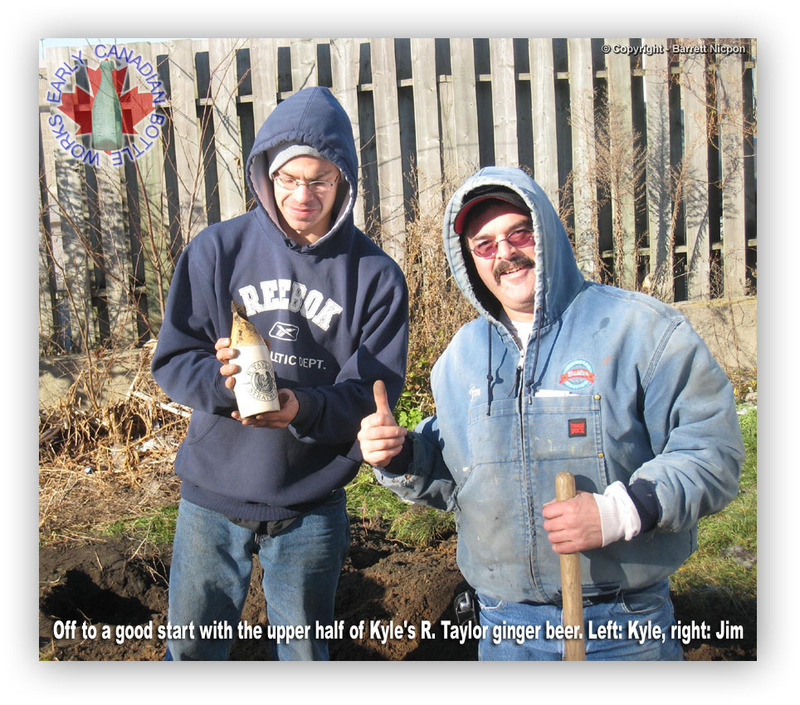 Within the first hour of excavating that yard, Kyle, Jim & I together uncovered shards from at least 4 different R. Taylor ginger beers. 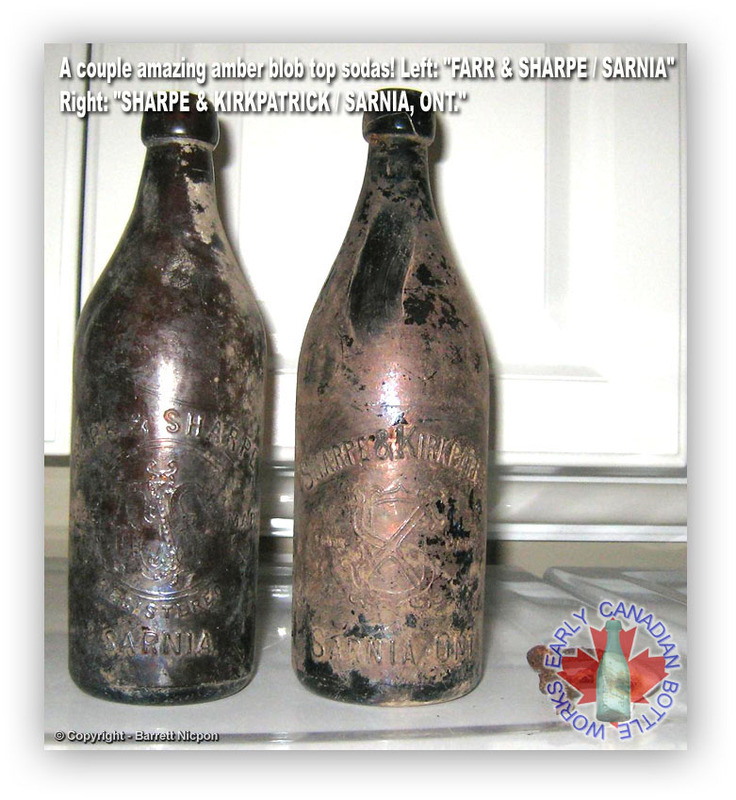 I also unearthed a couple shards from a FARR & SHARPE ginger beer from Sarnia, Ontario, which Jim informed me was a rather rare ginger beer as well! Jim began excavating a hole near the northwest corner of the rear addition of the house, near to directly between where Kyle & I had been digging. He began pulling some interesting shards from the ground, including a couple, close to intact, unembossed crown top sodas with just the tops knocked off. Jim pulled out the base from a ginger beer with just enough of the ink marking remaining to see that a phone number was advertised on the front of the bottle! Not something any of us had ever seen before on a turn of the century ginger beer bottle! Digging downward, Jim uncovered a well-preserved 1920’s “thunder mug” in an upright position, but with no bottle shards anywhere around it. I was still digging where I had been all morning when I hit another large shard from a ginger beer. It was a shoulder segment with the top and part of the upper neck knocked out of it. As I pulled it from the earth, I recognized the contours of the break well, as well as the separation of the tan and cream glaze colours on the shoulder. I tossed it Kyle’s way and said while trying to hold in my glee “I think that one is yours – you owe me.” He knew what I meant, and ran to the car to grab the bottom half example he had found the day before. Jim & I conversed about life and the stars, and Kyle interrupted with a loud, excited “YES!” from the parking lot next door where my car was parked. He ran back into the yard holding the two pieces, one in each hand, and proceeded to unite them into one, 92% complete R. TAYLOR / TRADE MARK / STRATHROY” ginger beer! As I mentioned, neither Kyle nor I ever expected to own an intact example, and all the examples Jim had ever owned, he had paid good money for – so this broken but repairable example taken from the earth ourselves was an incredible find for all of us! Jim began to hit virgin clay, and as he tunnelled beneath the addition on the back of the building, was hitting only very sparse quantities of shards. Kyle was digging where he had been yesterday, and wasn’t pulling much out either, so both of them decided to go to the back corner between the addition and the house. Jim dug directly in the corner, and Kyle dug slightly farther out into the yard from it. He uncovered a small concrete wall just beneath the surface, and eventually discovered that it was a cistern or septic tank of some type, and he was tunnelling down into its interior. A wealth of 1940s bottles poured forth from the hole (perhaps not a wealth, but a large number, nonetheless), including the upper half of a “STRATHROY / CREAMERY” embossed pint milk bottle. We were all wondering about what may lay in the bottom of the tank. Jim, all the while, was still pulling out shards where he was digging in the corner – quite a thick concentration of them, actually. Mostly bases – some with the characteristic R.T. for R. Taylor, and some with a large, uppercase ‘M’ for Murdock, then the occasional with a similar, uppercase ‘T’ for Tune. All the while, I continued plugging away at my digging, but was unable to find anything short of a few R. Taylor ginger beer shards, including a couple complete tops with R. Taylor–marked stoppers still remaining in them, as well as a LAMBERT & TURNER Hutchison soda bottle with the top knocked off. I was still eager to find something in the way of an intact bottle, and I intended to make that happen! The owners of the house returned again at that point. As they had said, they had been back and forth taking things from the property. This time, though, they returned with another fellow whom had bought the rights to scrap the wooden trim and siding present in the house. They proceeded to present to us a basket of old baby bottles and other such glass they had removed from the basement. We began discussing the basement and that fellow whom had been digging there a few years before. Conversations flowed, and we ultimately wound up obtaining permission, with the scrap man’s cooperation, the right to explore the basement for any bottles which may remain from his digging endeavours years ago. Entering the house through the front door, it’s everything you’d imagine of a century home fated to be demolished in one week. The hardwood floors show the outlines of where the furniture once stood from 100 years of pleasant memories – Christmas dinners, newborn children, and, of course, soda making! What a shame to have such a beautiful house torn down to make way for a sterile medical clinic. We were led through the living room, the kitchen, and into the washroom, where the crawlspace was obvious – a large rectangular hatch on the floor with a small handle sunken into the floor so as to not catch on people’s feet. Opening the hatch, you’d swear you were looking into a 16th century dungeon, were it not for the yellow bricks of the walls’ composition, and the flicker of the fluorescent lights as the home owner turned on the basement lights. Directly at the base of the steps was a dirt floor, surrounded on all sides except one by wooden retaining walls crudely nailed up, probably over 70 years ago by the aged and dust-covered nature of the wood. Descending the stairs, I set foot on the hard-packed dirt floor, and the cold, damp air of the basement fills my lungs. There is a shelf directly in front of me packed with common mason jars, and with a few small shards from aqua quart soda bottles evident, as well. On my right there is a wooden retaining wall. Behind me there are more wooden retaining walls, holding back a large quantity of sand within a crawl space area under the kitchen floor. To my left there is a doorway leading into the main basement, where the furnace and water heater are located. Upon entering this room, a second crawl space is apparent through a small gap near the top of the concrete wall on the far wall of the room. The owner of the house tells us that anything they have left behind in the basement is fair game to take, as they won’t be coming back for any of it. The room is full of wine and beer bottles – apparently the owner made wine at some point - and dollar signs flash in front of my eyes at an opportunity to make a few dollars in deposits (That’s not the type of bottle this story is about, though). We began exploring the basement. In the main part there didn’t seem to be much promising material save an old 2 gallon crock, which the scrap man had already claimed. Jim climbed up on a chair to poke his head into the crawl space at the front of the house. What little light there was seemed to negate any possibility of there being anything in this crawl space. The ground was clean, pure sand , with only a few small boards and wicker baskets strewn about it. 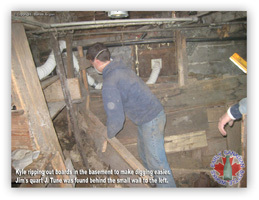 There was nothing in this crawl space – clean as the day it was sealed in. So, we focused our energy on the dirt-floored room where we entered the basement. There were no lights in this room, though, so it was nearly impossible to see anything. The scrap man and the owner had left the basement by this point. The scrap man said he would be working upstairs, and just to walk out when we were done, as he was going to be present for quite a while. I was checking behind the stairs, Jim was checking in the corner where a large iron pipe was buried down into the sand, and Kyle was checking behind some boards nailed between some posts beside the stairs. I didn’t find much where I was looking, save a few small quart soda shards in aqua, and had moved over to gazing unsuccessfully into the darkness of the crawlspace behind the stairs, and Jim’s search was of unknown success, when Kyle, beside me at the time, suddenly yelled out “Oh, [expletive]!” and plunged his hands into, from my perspective, darkness. What he pulled from that darkness made us all gasp! A 6 quart basket came into view, and held within its thin wooden walls, at least two 90% complete ginger beer bottles! Kyle put the basket on the ground and began rooting through its contents while Jim & I stared on. “I think there could be an intact one here, guys!” Kyle enthusiastically informed. One of the ginger beers was a J. Tune out of London, broken off directly beneath the blob top, and the other was an R. Taylor, broken off about two inches above the tan line on the shoulder of the bottle. The bottom of the basket was littered with shards, as well. We tried to assemble an intact bottle from the shards, but were unable to. But this piece was among the closest to intact shards we had recovered yet, and we were enthused to say the least. Glancing off into the darkness of the crawl space behind the steps of the basement, I could see the glitter of glass fragments amongst the sand, and I just knew there was something up there. Jim had a utility halogen light in his truck, and ran to get it while Kyle & I discussed the ridiculous possibilities. Most of them entailed crates of R. Taylor ginger beers intact lying in the corners of the crawl space. Although what await us when Jim returned was not quite so dramatic, it was still quite amazing. Working to plug the light in somewhere in the technologically recessive basement, we eventually ran the cord up into the washroom upstairs. One quick glance about the dust and sand-filled crawl space sent Kyle & I fighting to get into the cramped space before one another. 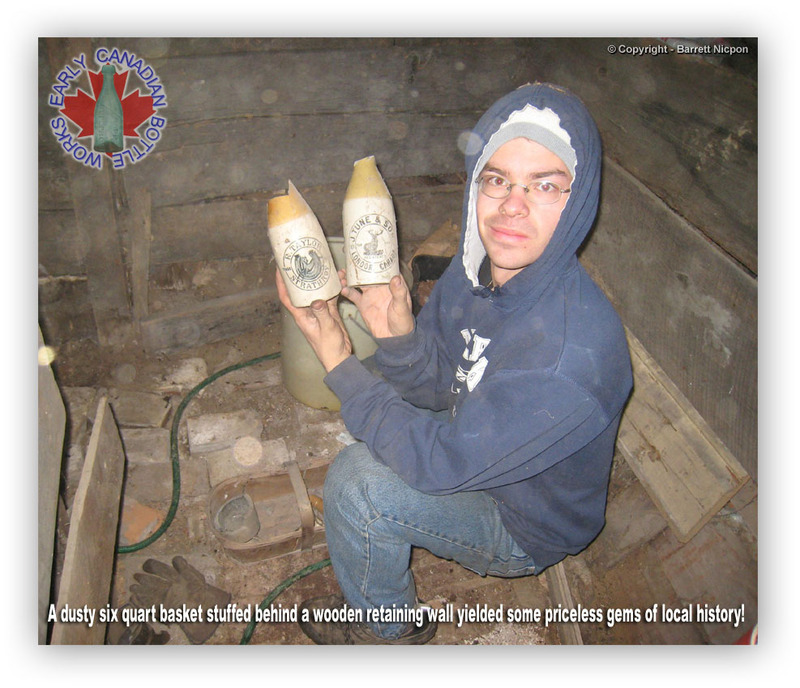 There, laying against the back wall of the crawlspace was a pile of, what appeared to be, intact bottles – including a clear seltzer, a couple hutches, a couple crown top pints, and a couple quarts. Some appeared broken, but although Jim warned us to “Calm down – they’re all broken”, we continued our mad dash in a horizontally limited running plane. Arriving at the finish line at the same time, we began to root through the bottles furiously. Shards flying everywhere (well, not really – but for added drama! ), we discovered 2 R. Taylor hutches, both with their tops broken off, one crown top R. Taylor with the top in mint condition (figures), even with an original bottle cap still in place, and a quarter of the bottom broken out of it, an R. Taylor seltzer cracked into dozens of pieces but held together by calcification of the cracks, an R. Taylor crown top quart with the top broken off, an emerald green J. Tune quart from London with the top knocked off, and some other miscellaneous Ontario sodas with large portions missing. Jim was right, and every bottle was broken in some way. The most intact one was probably the seltzer. Looking around the room, we remembered the owner telling us that someone had dug around here years before – because this was clearly where he had done so. The sand was unevenly piled up, shards were dispersed everywhere, and in the back corner was a hole about one and a half feet deep with a shovel still sticking out of it. He had dug the place right down, and piled all the near to intact bottles he found in a stack by the wall. The ginger beers in the basket must have been his, as well. We had been beaten to it. No worries, though, we decided – he can’t have found it all, and there are historically significant shards to be had, no doubt. And, since we were still keeping every R. Taylor ginger beer shard we found, much was to be had, as some of these were visibly laying around in the dirt. We dug around quickly, but stopped quickly as the dust suspended in the air was enough for us to be in danger of succumbing. So, while Jim went to the backyard to dig around a bit, we ran to the local T.S.C. store to buy respirators or dust masks. While we were out to get the masks, we decided to make a quick detour to the beer store, where Kyle picked up a case of 18 bottles of Blue, to celebrate both his turning of age, as well as our ginger beer discoveries. Returning to the house, we confronted Jim with a Blue, and he was more than happy to drain one with us. It was exhausting digging these holes, and that basement was dry, to say the least. We drank in the backyard, and laughed about the incredible nature of the whole experience, and how rare it was that we all get to dig a soda works. But this break was short lived – we were all too eager to get back inside and dig. 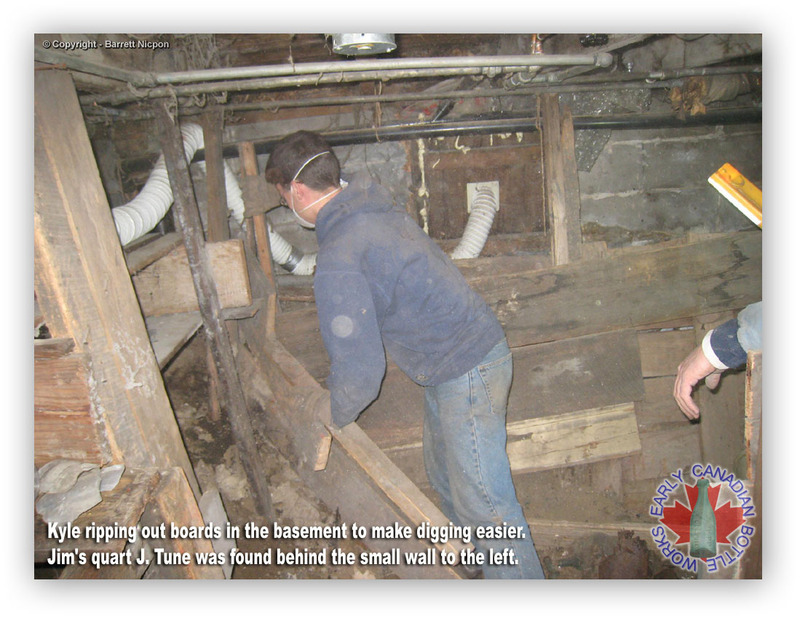 Kyle & I scampered back into the crawlspace while Jim decided to investigate the dirt being held back by the wooden retaining walls. Kyle began scraping around, and almost instantly, he gasped, and held up an intact hutch soda... a cobalt blue intact hutch soda! I called for Jim, “Jim, Kyle’s got an intact hutch soda... a cobalt blue intact hutch soda!” “C. ANDRAE / PORT HURON / MICH.” The bottle read. We were a little upset that it wasn’t some kind of Ontario hutch in cobalt blue, but it was an intact bottle, and from just barely outside of Ontario. Pressing forth, we continued to rake, while Jim decided to head outside for some more digging. Before he left, he warned us to keep an eye out for shards of a G.E. Murdoch seltzer bottle, as he had heard rumours of one. It seemed logical that if one existed, this would be a good place to turn it up! We scraped around for about 45 minutes, pulling out ginger beer shards, hutch halves, and large portions from seltzers, as well as the tops from quart blobs and crown tops. Kyle explored the back corner of the space, and suddenly reversed himself to show me another intact hutch which was wedged up against the corner. It appeared unembossed at first, but a little more checking showed that the base was embossed “P.C.FOY / TORONTO” – a manufacturer we had never heard of. Unfortunately a large chunk was missing from the lip, but another intact hutch none the less – things were looking up! I continued to scrape around in the dirt, hoping for another intact hutch. Jim returned to the basement about a half an hour later checking to see how we were doing. He had obtained permission to tear out boards in the back addition to dig beneath it. He had turned up some small shards of glass, though nothing nearly as dramatic as we had in the basement. Just as he came down the step, I scraped up a piece of glass in that characteristic peacock blue seltzer colour with an interesting marking. I saw and heard Kyle hand Jim a shard of a similar colour, and I knew what we had found. My marking had “OCH” acid etched into the blue glass, and Kyle’s had a thistle etched onto his. Jim was aghast. We had just found a G.E. Murdoch (note a different spelling than the aqua quart crown top pieces!) seltzer in blue! Unfortunately only shards, but prior to this day, these pieces were merely a rumour! Jim was happy to say the least, but near crying just imagining how nice a seltzer it would have been! Jim & Kyle remained in the basement after that, but I had no choice but to get out. The unsettled dust in the air was suffocating, even with the dust masks. I decided to go to the backyard to dig while they kept working that basement. I could see where Jim had pried up some floor boards, and dug there for a second, but nothing appeared, so I removed myself. There was a small gap between the concrete step, and the beginning of the floor boards on the inside of the addition, where the wood had rotted out. I took a few shovelfuls out from there, and pulled a ginger beer base out. It looked interesting, but I couldn’t get the leverage I needed to dig very deep, so I had to stop. I was just readying to go dig outside once again when I heard some kind of loud cry from the basement. I figured they had found some kind of crier once again, and decided to wait a little while before checking it out. I dug an R. Taylor porcelain stopper from a ginger beer, as well as a base from an awesome light green R. Taylor quart blob soda, another real crier, when Kyle emerged from the house. “We got something whole!” he said, and indicated that I should come into the basement to look. Naturally, I dropped my shovel and followed him. I descended the stairs, and noticed rather quickly that the wooden retaining walls which once adorned the wall directly in front of me were gone, and dirt had spilled out all over the place. Jim was holding a quart soda with a crown top – intact! “A Tuney!” he exclaimed and handed me the bottle. Finally an Ontario soda intact! “J. TUNE & SONS / TRADE MARK / REGISTERED / LONDON, ONT.” It read. Apparently they had ripped out a board from that wall, and dug around a bit, pulling some dirt out, when the bottle quite suddenly rolled out from between the remaining boards! Although not the most desirable or rare soda, it was still a 100 year old piece with a lot of history, and it was intact! Kyle had also pulled out the lower half from a Sharpe & Kirkpatrick quart from Sarnia in an awesome dark amber colour! All three of us were alarmed by the presence of this piece – an amber quart is obviously a rare and valuable bottle – perhaps we were in the presence of true rarity in respects other than just ginger beers! Jim announced that he had had his take, and had to return home, as his wife had been calling him again, but that we should drop by his place on our way home to drop off the light, and establish a date for our next dig. We agreed, and began to rip that wall apart like nobody else could. We dug and dug and ripped and dug some more, pulling out shards, ginger beer parts, metal chunks, and then... “Clunk!” – that hollow, solid sound your shovel makes when it connects with an intact bottle. I scraped away some dirt, and I could see a base from what appeared to be a York Springs quart crown top! We had found countless examples of this bottle, but nothing intact! I was crossing my fingers as I continued to dig away more of the bottle. Looks good... looks good still... I snapped a photo before prying my fingers beneath the century-old glass to pry it from its grave of 80 or more years. 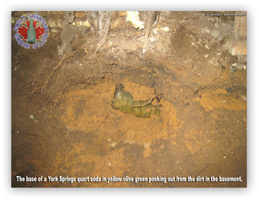 It was a York Springs piece in that awesome yellow green colour, sure enough, and... the top was knocked off. Dang it! Oh well – you can’t win them all... though to win one and pull a quart soda out intact would be nice! We dug the dirt in that basement until no grain of it was in its original geographic location - and the reward; nothing, once again. But no worries, as we had had a good day – Kyle & I had each added a scarce and very expensive ginger beer in specimen condition to our respective collections – one so scarce and expensive, as a matter of fact, that we were both accustomed to the idea that we would never acquire one! 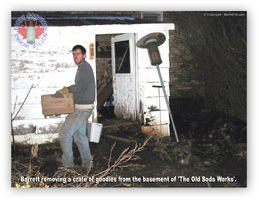 Gathering up our shards and the top-knocked-off bottles we had found in the crawlspace, we began to remove crate after crate of goodies from that dusty cavern. All those wine and beer bottles had to be packed up and moved into the now-vacated shed in the back for me to pick up later and bring back for deposits. Several loads of empties and crates of... older empties later, we were leaving the home, saying our salutations to the scrap man, though not to the owner, whom had already left. Kyle mentioned something curious about the man himself. Apparently our friend the scrap man was none other than a fellow whom had invited us to dig in his yard in the year previous. We had never had a chance to drop by, though, and his yard remains virgin, despite living in a century-old yellow brick beauty of a home. We really have to make a note to drop by some time. Another day done, and a still growing bottle collection to show for it. We looked at the destruction we had already caused in the back yard – holes and mounds of dirt everywhere, and even more numerous were shards amongst them. We still had not yet managed to find a single trash pit or outhouse – just this superficial layer of bottle shards directly under the surface. Still – another day, another dig, and we had the rest of the week to make real history here. 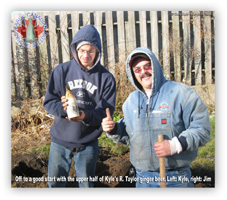 Kyle, Jim & I – digging, and preserving the history of, the local soda works. As on any ordinary Tuesday morning, I awoke at around 9:30, showered, brushed my teeth, clothed myself, ate breakfast, headed off to Earth Sciences class, learned about fault lines and mineral composition of the various layers of the earth, and then headed back to residence. This is where this particular day began to differ, though, in ways I’m sure you can imagine already. I decided on this day that, instead of heading to psychology class at 12:30 that afternoon, my time would be better spent liberating some fragile antique bottles from certain doom at the claws of heavy equipment designed for ripping down buildings. I tried to call Kyle to see if we were hitting up the dump site, as we hadn’t been entirely clear on when we were planning on digging this week as of our last meeting. Kyle, however, was still at work, so after he didn’t pick up following 10 rings on his cell phone, I decided to hit up the site myself, and try and get a hold of him after work. After eating a short bit of lunch at 11:45 following my class, I headed for Strathroy, and the site of our beloved soda works. By this point, a couple frosts had ripped across the ground in the area, and when I finally arrived and began hacking at the soil, I really had to hack at the soil, as a good 2 inches of it were frozen solid. I commenced the digging near the back steps again, unearthing, this time, quite a few hutch tops with their original stoppers, more ginger beer shards, and this time quite a number of R. Taylor white porcelain stoppers to match with the ginger beers. Figuring they would be useful for pairing with some of the bottles I’ve got around home already, and whichever ones Kyle & I may acquire in the future, I held onto them. Another base from a third example of those amber Wilson quarts with the squirrel on them, and some shards from a green J. Tune - I dug for an hour, and not much turned up in the way of intact pieces. “Hey, You!” Someone shouted from around the side of the building. “What do you think you’re doing?” I was frightened. Someone had called the police! But we had permission! How could I be arrested when I was explicitly told by the home owners we could dig. But what if they aren’t actually the owners, and were merely renting the house? What if the construction company had already acquired the property, and we were just the victims of public exclusion of information? I looked up to meet my prosecutor and there was Jim, smiling madly. “You scared the hell out of me!” I said, and we both began digging. I continued digging where I was, but it was obvious that Jim was itching to find some better place with more than just 6” inches of solid shards in the very top layer of soil. He proceeded back into the corner where he had been digging the day prior, and began splitting open some soil chunks. The ground was not frozen yet in that back corner, as it had apparently been protected from the frost, and in days prior, he had been finding shards deeper down than anywhere else on average. I decided it was worth a shot, and began digging just a little bit out from the house from where he was – right beside where Kyle unearthed the cistern full of 1950s stuff. Within minutes of digging Jim hit what appeared to be an intact quart soda. 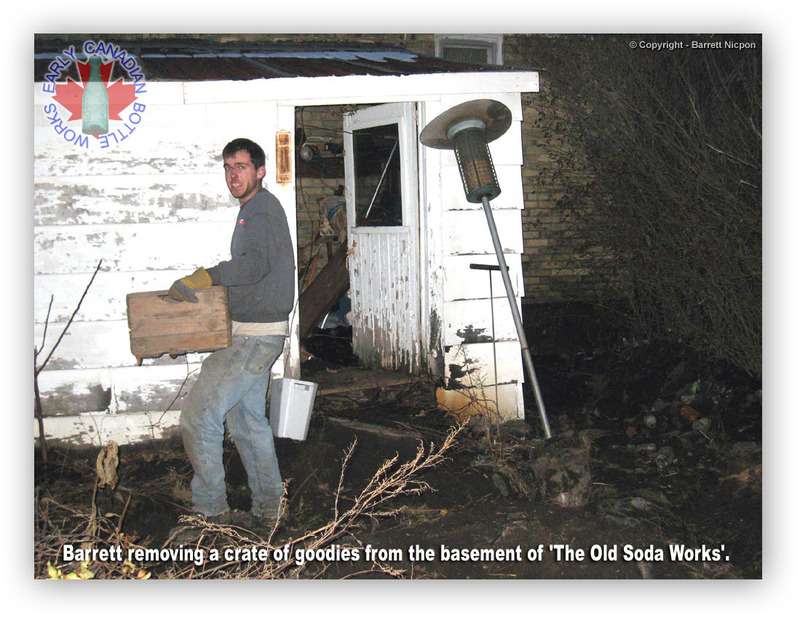 We were both excited to say the least, as this was the first quart soda anywhere close to intact in the yard area – perhaps we were into a pocket! Although into a pocket of sorts, it wasn’t quite what we hoped for. After gently tugging at the bottle for a minute, he pulled it from the earth, to find “R. TAYLOR / TRADE MARK / STRATHROY” looking back at him from the bottle, but no lovely crown or blob top to ornament the classy glass bottle. “Another crier”, Jim spat. I spat with him. About 2 seconds after resuming his dig, though, Jim hit yet another apparently intact bottle, and suitingly, both the same marking, and severe damage awaited him when he tugged it free. After pulling a quart J. Tune from the ground in the same place and in the same condition, we knew we were in a pocket. Although everything was broken so far, at least it was more intact than most everything else we had found so far in the yard. I was excitedly digging downwards, and was finding larger chunks of glass here than anywhere else, as well. The entire front face from a G. E. Murdock, and an R. Taylor quart broken off at the shoulder came out next. Jim & I discussed the apparent high volume of bottles the average soda works went through throughout its years of operation – we must have already unearthed over 500 bottles broken in this yard, and who knew what was to come? We both thought it was fascinating that so many of the bottles in the yard still had their caps attached, another interesting fact was how comparatively few blob top sodas there were, considering the works was obviously around during the time of blob tops. Almost everything here was crown-topped! We still weren’t clear on which soda works it was that we were digging, though we hoped to be able to find out through evidence yet acquired from the site. By this point, Jim had pulled out several more, large bottle chunks, though nothing else really close to intact. He had begun to tunnel under the side of the building, and more shards were falling out from beneath it. We decided the best idea here was to ditch all along the side of the building, and then work our way underneath it – who knew what attic mint bottles were laying beneath the floor boards? Jim had already dug his end of the ditch, and I was working the middle, so he decided to move down to the other end of the addition, on the other side of me. He dug downwards the same way, noting the apparent drop off in the number of large shards. Still lots of them, regardless, but there were less pieces broken off at the shoulder or neck, and more just base shards. I was noting the same thing, and as I tunnelled under the building, I noticed there was an almost complete drop off in shards – I was limited to just a couple quart fragments here and there. As I dug downwards a bit, though, I realized there was a deeper layer of ash, concrete, and bricks just under the sand which adorned the surface under the building. Jim was working the same layer when out rolled a clear crown top SHARPE & KIRKPATRICK quart from Sarnia with just the very top ring of the lip knocked off! It had apparently been in the top layer of sand, but we were unable to tell for sure, as a minor cave in had resulted in the piece appearing. Setting it aside, Jim continued to work. Not knowing what to expect, or where to expect it, I was digging blindly, trying to get a feel for the various layers. There were more shards in the ash/brick layer, but very small ones only, and the Sharp & Kirkpatrick had come from the sand layer. As I was contemplating where I should dig, I heard Jim reference the higher power, and knew something was going on. “My God...” he said, followed by “Oh my God!”, which inspired me to look over. Laying in the trench Jim had been working his way along under the building, almost exactly where the Sharpe had rolled to, was a quart blob intact, with the original wire bail still attached. He picked it up carefully, slowly, and my perception of the scenario as he wiped the dirt off the front face was actually in slow motion, I swear. The bottle was not aqua, and it was not damaged. It was an amber blob quart. “Farr & Sharpe!” he yelped “It’s an amber Sarnia Farr & Sharpe!” Amber it was – the most beautiful medium shade of it I had ever seen (except in the amber M. Bixel dig). Jim was ecstatic! “I have never had any luck digging,” he was shouting, “But would you look at this thing!” he was obviously enjoying having just pulled an obviously valuable, and potentially very rare bottle from the ground himself! I could live with it, as well – the man had not made any good finds while digging, and for the amount of work and ingenuity he had put into this dig, I thought he deserved to! We were both ecstatic and a little more encouraged to say the least – the first intact bottle of the day, and the first intact soda in the entire yard, had been an amber blob quart from an Ontario town! What more could you ask for? I could have asked for something intact, that’s for sure. Fortunately, though, I didn’t have to. Jim was obviously hitting a lot of good stuff, as after a continuing few minutes of digging, while I was finding naught but shards, he hit what appeared to be the base from a seltzer bottle. By this point, we had noticed that it had once again become very dark out. I had been digging for easily 5 hours already, and Jim probably 3. Fortunately, Jim had brought his halogen light again, and told me to work on digging out the seltzer while he went to his truck to get it. I jumped into his trench gleefully, hoping to be able to pull something out intact as well. 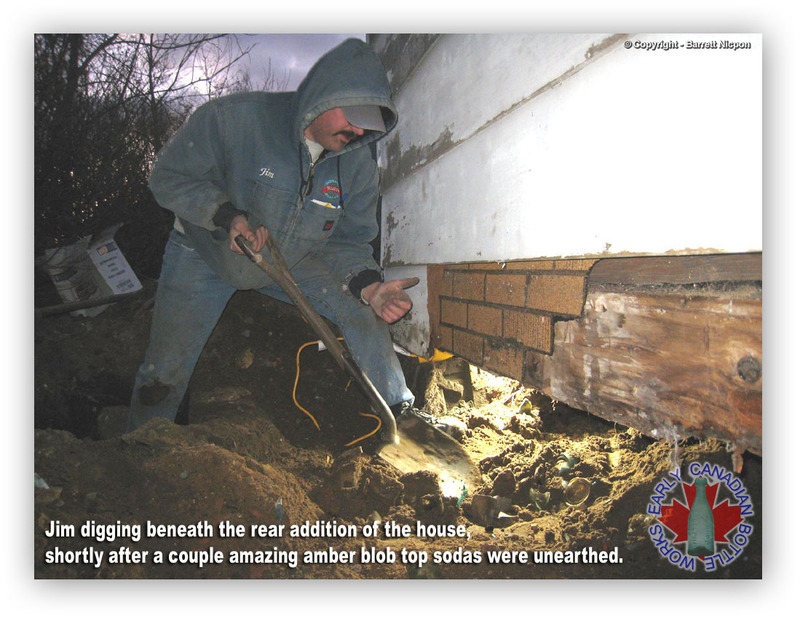 The seltzer was protruding from the edge of the hole about 8” deep, at the bottom of the sandy top layer. Only the very base edge could be seen, so I proceeded to dig away some dirt above it to try and get some leverage to dig the beast out. 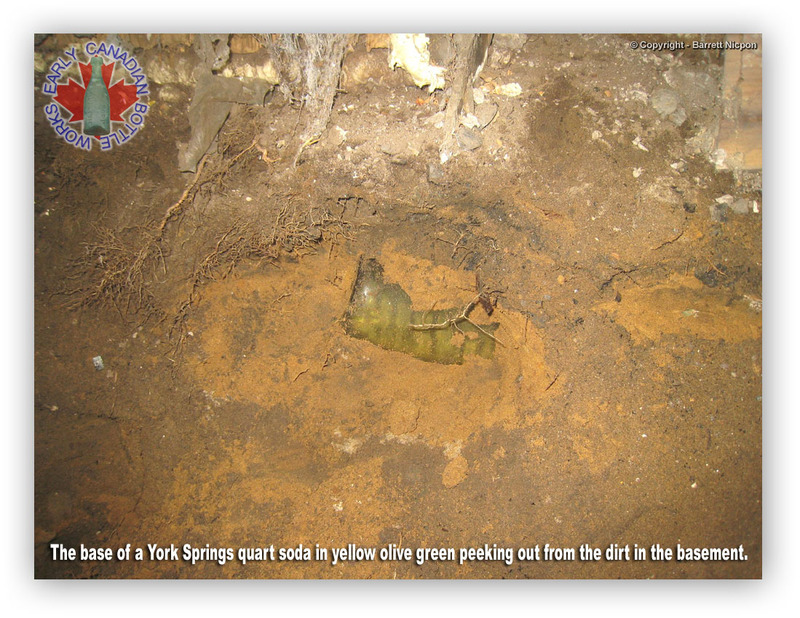 After maybe only 4 seconds of digging, I heard that satisfying “Clunk!” of the shovel against what appeared to be the intact base from a quart soda as well protruding from the side of the hole, though this time no more than 2” under the surface – right near the top! It was very dark in the hole, but the rhodopsin in my retinas had begun to replenish itself, so I was able to see something of the bottle I was excavating, and if there was one thing I could tell about it, other than that it had the right diameter and thickness to be an Ontario quart soda, it was that the bottle appeared very, very dark... amber almost. My heart, by now, was obviously pounding, as I used the trowel to scrape those top 2” of soil off the bottle, and pry some more from underneath until I was able to get my fingers around it. I gently tugged. The bottle gave way with ease. And then there it was. I was looking at the front face of a “SHARPE & KIRKPATRICK / TRADE MARK / SARNIA, ONT.” quart blob with the intertwined initial insignia, in mint condition, with an R. Taylor white porcelain stopper attached. The real kicker, though, was the colour. An even darker shade of amber than Jims... which made me flip out more than a bit. Laughing like a mad man, I called to Jim, and placed the bottle under the edge of the building, so that he wouldn’t be able to see it when he first ran around to see what was amiss. In the mean time, I continued to try and dig out the seltzer. Jim came flying around the corner with an extension cord unravelled and grasped at one end by his left hand, the other end heading up towards the front of the building, and the utility light in his other hand. “What did you get?” he asked excitedly. “We can both go home happy today, my friend!” I laughed and withdrew the bottle from the darkness. His face went straight and his eyes opened wide with excitement and surprise. He knew how unlikely it would be that we would find two amber quart blobs within mere inches of each other, in mint condition, beneath the floor boards of a building, when absolutely everything else that had emerged up to that point had been badly, badly broken. We both knew. Yet there we were, stewing in the improbability of it, and loving every second. I was so excited. And then I remembered... Kyle. He had been at work, and I hadn’t dropped by to tell him I was digging. I had tried to call, but to no avail. I decided I had better go get him before anything else ridiculous in its level of improbability emerged from the ground. Jim had just realized that the electricity in the building was apparently off, as his light would not work, when I departed. I put the quart blob in the back seat magazine holder of my car, and made sure to turn the heat off, so as not to crack it, started the car, and drove down the street to Kyle’s place of work. Of course, upon arriving, his co-workers informed me that he had literally just departed seconds before I arrived (I may have passed him on my way in), and that I should try his home. I used their phone, and left a message with his mother indicating that he should “Get his [expletive] over to the dig site ASAP, and bring flashlights.” I thanked his mother, complimented her cooking, and then hung up to get back to the dig site. Jim had discovered that, for some unknown reason, the electricity was still on next door, and had his light working when I got back. He was tunnelling well under the building by this point, and an R. TAYLOR seltzer bottle with just the top knocked off, was sitting on the concrete step next to him. After noticing the awesome acid etching on the bottle, I asked him what had come out since. “Nothing.” he said. We had reached dead sand once again. I got back into my hole, and spent several minutes just shovelling dirt out in order to clear my side of the trench out. Tossing the dirt behind me for several minutes, I was finally down a good depth into the ash/brick layer, just as Kyle arrived with two flashlights. Obviously, I took a break from digging to show him the stuff we had found. The seltzer, freshly unearthed, and the R. Taylors, J. Tune, and Sharpe & Kirkpatrick with their tops knocked off. “But that’s not all...” I trailed off, and brought him to the car to show him the key piece. He was shocked, as would be any bottle collector who knows how tough an amber quart soda is to dig. “Why didn’t you try and call me?” he said, “I must have missed the best day of digging so far!” I explained that I had called, but Kyle’s cell had received no messages, which I thought was odd. It is of no wonder why I do not trust technology. I apologized for not getting a hold of him, and after arriving, both Jim & I agreed that some subsequent awesome find would be going to him, regardless of whom finds it. No subsequent finds would be made that day, though, as Jim took off shortly afterwards to eat dinner with his family, and although Kyle & I continued the dig for a good hour in the pitch black icy cold outdoors, lit only by one utility light, we found nothing more than quite a number more shards, and the remains from some 1930’s newspapers. While cleaning up all the gear, and making a couple trips back to the car, I was confronted by the lady that owned the house farthest along in the grouping, farthest away from the one we were currently digging at. She was curious as to whether or not we had permission to be digging, and I assured her that we did. While we were talking, I managed to ask her “the question”, as well, and she was fully willing to allow us to dig in her yard. I thanked her, and continued to load the car up with bottles and shovels. We drove the way up Head Street to get to Jim’s house, where photographs were in order of the two star bottles of the day, as well as conferencing with reference to the history of the building. Jim poured us all a beer, and we drank as we observed his amazing collection of Strathroy bottles. There was the round slug plate pint G. E. Murdock, and the emblem-less R. Taylor quart blob – incredible bottles all around. Jim cracked out his research books, with dates and locations, and we began to pour over them. We talked until late in the evening – probably 9:30 PM. We swapped stories, history tidbits, and insight into what it was we were doing. The upcoming Friday – 3 days later – would be our next collective dig, and we would make it a good one!